WHAT: The University of Missouri will host the second installment of the One Health/One Medicine breakfast forum series, which will feature researchers from the Ellis Fischel Cancer Center. At the forum, “A Contribution to Cancer’s Cure,” speakers will discuss research in comparative oncology and comparative medicine, a collaborative effort of the MU School of Medicine and the College of Veterinary Medicine; the new patient care tower; and the impact of the MU Health System on the local economy. 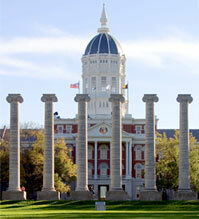 The forum is presented by the One Health/One Medicine area of Mizzou Advantage. Mizzou Advantage is a program that focuses on four areas of MU strength: food for the future; media of the future; one health, one medicine; and sustainable energy. The goals of Mizzou Advantage are to strengthen existing faculty networks, create new networks and propel Mizzou’s research, instruction and other activities to the next level. The series is a means to introduce the MU community to the innovative research and clinical care taking place at the MU Health System. 2601 S. Providence Road, Columbia, Mo. NOTE: The event is by invitation only; media are invited to attend the event.